Mink Trap Bait - What's The Best Bait To Use? Choosing the best mink trap bait to use on the trapline or to catch a mink that's been killing your chickens and causing havoc for your poultry is an important decision. After all, if you want to catch a mink you'll want to choose a bait that's a natural part of their diet and also something they find irresistible. 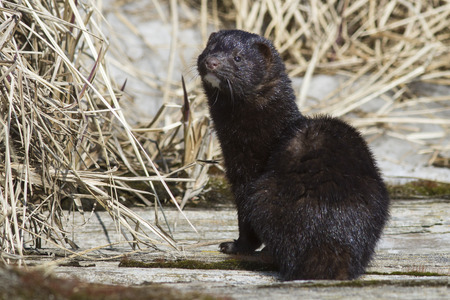 Mink are carnivores that love to eat fish, crayfish, frogs, mice, birds, rabbits, snakes, muskrats and chickens....which is why many small farms usually turn to trapping mink to help save their chicken coop from total destruction. Although they're small, mink are ferocious hunters often cleaning out an entire chicken coop in a single night. They generally kill their prey by biting them in the back of the neck using their sharp teeth to quickly dispatch the animal, then in a fury they typically move on to other nearby chickens killing multiple birds only to eat a small portion of one. If you're experiencing problems with a mink killing your chickens, trapping is one of the most effective ways to eliminate the mink that's causing the problem. The topic of which bait to use to trap a mink is often a topic of many opinions. While you can use many different types of bait or lures to successfully trap a mink, the following options are generally the best choice. Using these baits will dramatically increase your chances of trapping a mink, whether it's on the trapline or simply to remove a nuisance mink around your home or farm. Fresh fish works great for trapping mink in the early trapping season. Fresh fish also works great in a live trap if you're targeting a mink around your chicken coop. Since mink seem to prefer fresh fish over rotten fish, you will typically have to change the bait out every couple of days in order to keep it fresh. Fresh scraps (especially fish heads) from a local fish processing station is a great place to find the bait if you're not a fisherman yourself. If you have access to a lot of fresh fish at one time, try freezing the bait until you're ready to use it. Although it might not work quite as well, freezing it doesn't seem to have too much of a negative effect on the bait. Tinned mackerel (the kind found in a can) can be purchased from your local grocery store making it an easy way obtain the bait. Plus, since the mackerel is canned and stored inside an oil like liquid, the mackerel will usually last longer than a piece of fresh fish and the oils can be used as an added attractant. Many trappers find tinned mackerel is one of the best mink trap baits used inside a live trap. A live trap baited with tinned mackerel is a great choice for trapping a mink around your chicken coop. For trappers, muskrat meat is probably the most preferred and best producing baits available. It's not necessary to use a whole muskrat, just a quarter or half will be more than enough to do the trick. Since you'll typically trap muskrats in the same area as mink, having access to some muskrat meat is quite common as the trapping season progresses making this an easy and cost effective bait for mink. When making a pocket set, try wrapping the muskrat meat in dry green grass before placing it in the back of the pocket set. Like the mackerel, tinned sardines also work very well for mink trap bait. Plus, since they can be purchased at your local grocery store for about $1 they're cheap and easy to find. Use sardines that are not in any flavored oil. Just plain oil or liquid is by far the best type of sardines to use. If you're looking to trap a mink, whether it's in a live trap around a chicken coop or in a pocket set along a stream on the trapline, try using one of the baits listed above. They're some of the best bait options available for trapping mink plus they're cheap and easy to find!